I grew up, got busy, and whatever skills I had acquired lay dormant until I took an adult education crochet class in my late 20s. I was lucky enough to be taught by the now fabulous owner of the 10 Hours or Less knitting and crochet website. At the time he was a then fabulous teacher who taught in addition to his day job. He was an excellent teacher, clear, funny, and calm. The calm was especially important because some of the things we’d bring in that we’d worked on between classes were seriously scary. Super tight stitches, looped within an inch of their life, drunkenly ragged edges of what was supposed to be a straight afghan, a sweater the size of a football player that was meant for a baby. This was fiber road kill. But he was unruffled. He’d calmly examine the patient, methodically track where things had started to go wrong, and tell us how to make it right. I crocheted an afghan made up of squares. After I mangled the first few, I got them fixed, mastered the squares, and I did pretty well. I remember doing it while the winter Olympics were on, and to this day when I look at that afghan, it feels like the Olympics are woven into. After the class, the teacher and I became friends and knowing he could get me out of pretty much any crochet trouble, I went to town. He thought the washing machine cover I made for my sister was part ingenious and part crazy. She lived in a small place and the washing machine was in the living area. When I asked my family if I could make them something, she said, washing machine cover. There were no other takers, and who am I to judge? I used the same squares as I had used for my afghan, but made them a color to match her house. The squares were easy to assemble in pretty much any cubic form. With that success, I started dream bigger, perhaps dangerously so. At the time there weren’t very many sweater crochet patterns, and I wasn’t about to learn how to knit. I’m a one-hook kind of woman. My teacher had previously been a freelance pattern designer, and helped me design and make a sweater. He rescued me any number of times through that one. I especially remember the collar opening was big enough for two heads and there was a lump in one shoulder that made my then husband look like Quasimodo. I called in my teacher. His quick hands unworked the unruly collar in a key place, he flattened the lump, and then stitched it all back to near perfection. He called it “Hiding the dead bodies.” I love that. The problem was my impatience. I’d see that the piece had started to go wrong, but I didn’t want to stop to undo it. Insanely I’d tell myself that it would even out in the end. Right, like the Quasimodo shoulder. I should have become more cautious and methodical, but with every fix, it only emboldened me to try harder patterns. My teacher could bail me out. I remember making a children’s cardigan sweater that had one front piece edge that was nearly perfect and the other … well, it gave even my teacher pause. Let’s just say, that yarn accident was only remedied with scissors, sewing tape, and vow of silence. Life got busy, and I stopped crocheting, and my teacher moved away to start his fiber empire. This past winter I got the urge to crochet again, all the prior crochet mishaps now a dim memory. And what easier way to start than to visit my friend’s website? 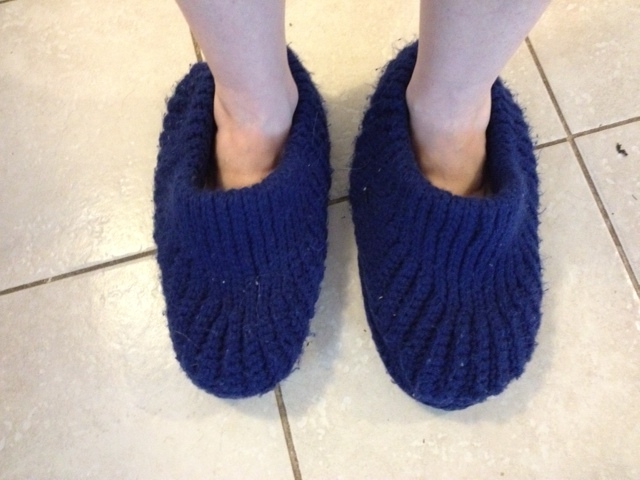 I needed slippers so I found a pattern, called Rolling Ridges. I even found some extra yarn and serendipitously, the winter Olympics were on again! I started in eagerly, my fiber bravado in full swing as the athletes flew off the ski jumps and zigzagged along the half-pipe. However, this was not to be a repeat of the squares afghan. I had trouble right off the bat getting the gauge right. Everyone’s stitches are slightly different sizes, so a pattern will tell you that so many stitches should be so many inches. Then you find the right size hook to match. I tend to be a loose stitcher, so I had to keep trying smaller and smaller hooks. I finally got the gauge right, but the hook was so small, crocheting was nearly impossible. Did I call my friend for help, which he surely would have given? Oh, no. I decided I had been apprenticed long enough, and it was time for me to go it alone. I would go up a hook size and compensate along the way—I mean how much could it matter? Overconfident mistake number one. As I looked more closely at the pattern, I realized there is a lot of counting. A LOT. Between my impatience and my dislike of numbers in general, this did not bode well. Add on that I was trying to watch the Olympics, and we have another fiber tragedy waiting to happen. To be completely transparent, there may have been a glass of wine involved. I’m just saying before you judge me, there were a lot of variables in play, none of which were related to my friend’s pattern. This was a user error. I will give myself some credit; unlike my previous tactic to crochet on as if I were England in WWII, I did pull apart the slipper sole at least seven times before I got it right. And by “right” I mean it wasn’t hideously large—just mildly so. I jumped into making the top part of the slipper without taking into account how the size of the sole was now off the grid. The rest of the pattern was no longer a close friend to the sole, but merely a stranger. Add in the counting of all those stitches that were supposed to line up with the sole, and you could perhaps even say a hostile stranger. Overconfident mistake number two. Midway through, I started to have flashbacks of the child’s cardigan sweater, but I was now in a fiber fever and couldn’t stand the thought of giving up, or god forbid, starting over. I just wanted to finish the damn things. I did finish them. Exactly how is between me, the slippers, and pair of sewing scissors that you will never, ever find. The 10 Hours or Less photo of the slippers is up top. That’s how they should look—all snug and cozy on your feet. And they could be that if you follow the pattern. However, if you happen to be a reckless crochet rebel like me, who’s been allowed to flout the rules for too long, your project is bound to look like this below. It’s more a swimming pool for the feet. But you know what? I wear them and just shuffle on the floor. As long as I don’t lift my feet off the ground, they actually work pretty well. Thanks to my excellent teacher, I’m not completely hopeless. And I am hiding one dead body—there’s a mini Quasimodo bump in the back. This entry was posted in Friends, Mid-Life, Musings and tagged 10hoursorless, afghans, crafts, creative life, crochet, crochet patterns, grandmothers, slippers, teachers on June 2, 2014 by sdeden. OMG, what a wonderful trip down memory lane! Would I sound like a doting teacher to say I LOVE your super-sized slippers? I think you did a great job. And I’m so proud that you continue to flaunt the rules – even if they’re mine. Awesome! I crocheted for the future without realizing it. I’ll surely be the envy of all the nursing home residents. Glad you enjoyed the piece, and it’s a sign of a truly great teacher who encourages a student to bend the rules :-). More crochet madness to come! Thanks so much! I forgot I made you an afghan! They last forever for better of worse 🙂 Glad you’re still enjoying it!